The concept of dieting would have been alien to our 17th Century forbears. In those days, the plumper you were, the better. Plumpness indicated wealth and class, and women aspired to be plump and white, rather than thin and tanned as is the fashion now. 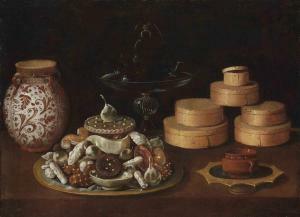 The 17th Century was when sugar became a major component of most people’s diet. The dissolution of the monasteries in the 1530s had led to new land ownership, and consequently to a new class of non-aristocratic landowners and despite the English Civil War, (or even because of it) this new class of landowners and rich merchants was here to stay. With political stability and the restoration of the King, came an increased desire for luxury goods and London soon became the richest supplier of foodstuffs in the country. Charles II's marriage to the Portuguese princess Catherine of Braganza in 1662, coupled with his long exile in France led foreign food to become all the rage, especially French food. French cuisine soon piqued the English palate, as their recipes included strong tastes such as anchovies, capers and wine. At this time the culinary words coulis, roux, ragouts and fricassé were introduced, and fancy French dishes were nicknamed kickshaws, after 'quelquechose', the French word for 'something'. ‘Service à la Française’ became the norm instead of the old medieval buffet style meal, with sets of cutlery laid out besides a personal plate and glass. Samuel Pepys was impressed to learn that his colleague the Earl of Sandwich was to employ a French chef, writing in his diary that the Earl had 'become a perfect courtier'. The East India company increased the cheapness of oriental goods such as sugar, spices and dried fruit. Of couse much of this bounty was based upon slave labour, but the human cost of sugar's production did not penetrate the consciousness of most Londoners. The pages of 17th Century drama are full of references to sweet food, Dekker talks of ‘biskets’ 'carowayes' and 'marmilade', 'sugar-plums', 'pippin pies' and gingerbread, or of ‘sucking pigs – a fortnight fed with dates, and muskadine’. In the picture right at the top of this post you can see many sugar-coated objects. Two are obviously pears, but the others could be an onion ring, or...well, what? Often the sugar coating was on actual meat, and obviously judging by the picture, the sugar coating was quite thick! There was also a fashion, as witnessed in Mary Fairfax’s diary for sugared flowers; she used violettes, marigiolds and roses, and even clover blossom in her puddings. 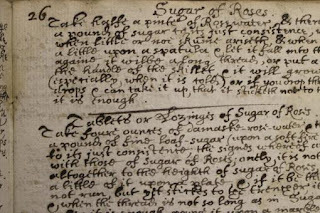 Below is a recipe for sugared roses. This was the great age of 'Receipt' or Recipe books. Following the fall of the monarchy, many house chefs from the landed gentry were redundant or had lost their livelihood, and this is probably why so many new cookery books were published at this time. Literacy amongst women was lower than amongst men, so most 17th century cookery books were written by men, although the recipes themselves were often from the women of the house. 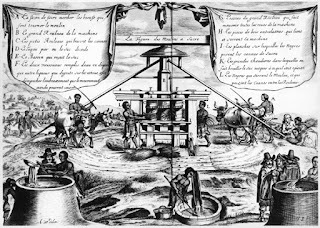 The publication of one of the first cookery manuals, Le Cuisinier François by François Pierre de la Varenne in 1651 caused a culinary revolution in France. La Varenne refines existing recipes, and suggests ways in which menus could be balanced, paving the way for a much more considered way of dining. The first course consisted of bowls of soups or stews, accompanied by prepared meats, the second of roast meats with salads and vegetables. Thanks to the French influence, the English realised that it was perfectly safe to consume vegetables raw, and began to enjoy 'salats' with their meals. The dessert (from desservir, French for ‘clear the table’), was often sugared fruit, and accompanied by 'sweet' entertainment such as music or dancing. Dessert often took place outdoors and in rich french households this course was laid out as a garden, complete with small buildings or statues in sugar-work. The idea spread to the English nobility with 'marchpane' (marzipan) sculptures. The towering sugared fruit was stacked as layers on dishes called 'pourcelaines', ornamental dishes on stands. With it, you would sip sweet, spiced wine, called hippocras. Of course the poor never had such fare. Sheep’s trotters, sweetmeats; every bit of the slaughtered animal was used, and the cheapest unsavoury parts such as cow’s stomach – tripe – and the extremities like ears and tails, were the diet of the poor. But for the well-to-do, the importance and status of costly food was such, that while the Great Fire of London grew ever closer, Pepys was desperate to save his bottles of wine and his parmesan cheese from the approaching inferno by burying them in his garden. I am currently enjoying dining with Pepys in research for my trilogy of books based around the women in Pepys's Diary. A Plague on Mr Pepys will be out on 5th July from Accent Press. There was a TV show, can’t remember the name, but you might know, where the people involved lived for a while on a seventeenth century diet - wealthy, not poor - and - well, it was not unlike the results of Supersize Me, when the man tried living on a McDonsld’s diet for a month... Not very good for you! I think you may have meant sweetbreads (thymus and other glands) rather than sweetmeats (a sugary dessert) for the diet of the poor.